Enough with the teasing. Today Hi-Rez Studios officially reveals the Norse squirrel god Ratatoskr, one of Smite’s most versatile MOBA combatants yet. First off yes, there is a Norse squirrel god, and while Ratatoskr is more of a messenger, carrying information up and down the world tree, if Mercury qualifies, so does this freakishly cute rodent. 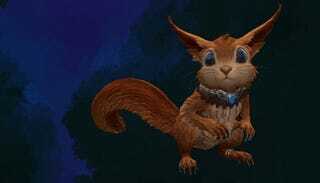 What makes Ratatoskr stand out from the increasingly crowded battleground? It’s his nuts. Seriously. The squirrel god is the first Smite character with a unique item—his acorn. Ratatosky gets three base skills and an ulimate like any other god, but those powers evolve based on how he upgrades his acorn. For example, he starts with the basic acron, then has a choice to upgrade to either the blue or yellow acorns. While both add power to his Flurry of Acorns skill, blue adds a slow to enemies hit, while yellow adds 20 percent more damage. The blue and yellow acorns have two upgrade paths each, further augmenting and specializing his powers. Plus they change his stripe color, which is awesome. Check out the official Ratatoskr reveal page for more on this squirrely skirmisher, including voice samples, videos and enough cute to infuriate everyone I play against once he goes live in the coming weeks.